Eugeneson Lyngdoh and CK Vineeth scored on either side of the half as Bengaluru FC wrapped up their Pune tour with two wins from as many matches and joined Mohun Bagan at the top of the table with 28 points. The Blues, who only two days earlier churned out a near-flawless performance in the 2-0 defeat of Pune FC, picked up from where they left as an answer to coach Ashley Westwood’s call to reproduce a similar show if three points were to be taken. Lyngdoh’s strike in the 29th minute came when Sean Rooney intercepted a poor pass from Surajit Bose before teeing up the ball for the midfielder, who placed a peach of a strike past ’keeper Shahinlal Meloli from 20-yards out. 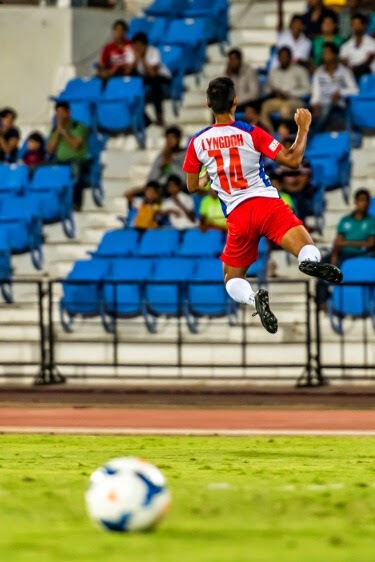 The goal was a striking replica of the one Lyngdoh scored in the home tie that Bengaluru won 1-0. Westwood started with an unchanged XI that took field in the 2-0 win against Pune FC on Tuesday while the only change on the bench was the inclusion of Robin Singh, back from serving a one-game suspension. Bharat, meanwhile, had a string of absentees owing to a combination of suspensions, injuries and a family emergency. But despite the goal, the half was an absorbing one where possession and attacks swapped hands swiftly. However, post the break was a different tale. Ten minutes into the second half and Bengaluru struck again when CK Vineeth scored his second goal in as many games. Receiving the ball on the break and down the left, Rooney made a run before passing to Lyngdoh, in the box. Skipping the option to shoot, Lyngdoh squared the ball to Vineeth who drew Meloli out before turning and placing his shot calmly, making it 2-0. With a two-goal cushion and Bengaluru completely in control, Westwood pulled off his goal scorers within a few minutes after the hour mark, replacing Lyngdoh and Vineeth with Robin and Sunil Chhetri. The changes added a fresh impetus to Bengaluru’s attacks and Robin came close to grabbing a brace of headers. Midfielder Joshua Walker threw in a fantastic shift in his role ahead of the defence while the back four were clinical in stuffing out every half chance to make it two clean sheets in as many games. Bengaluru next travel to Maldives on Sunday where they take on Maziya S&RC in a game, if they won, would send them to the pre-quarterfinal stages of the AFC Champions League.